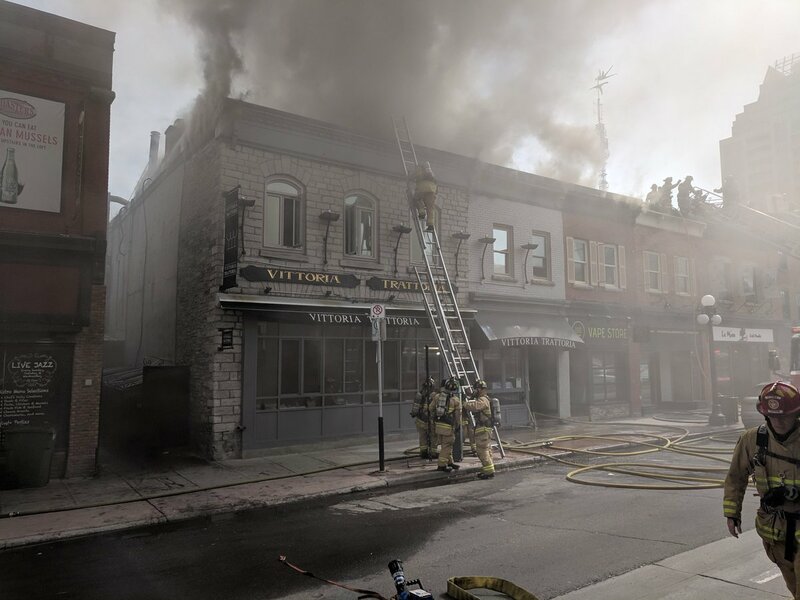 Business unaffected by Friday’s devastating fire in the ByWard Market reopened Saturday morning, while full account of the damage is taken. Damage is clocked at more than $2 million, according to Ottawa Fire. The service reported the first 911 calls arrived at 11:18 a.m. to report smoke coming from the roof of the building on William Street. A working fire was declared minutes later. People on Twitter reported seeing smoke in the sky around the same time. The fire spread through the connected building via the “cockloft”, an attic-like area. The blaze compromised the structure of the building and forced the evacuation of firefighters who were inside trying to beat it back. By the afternoon, the blaze had escalated into a fourth alarm. There was more than 100 firefighters working on it. The market filled with smoke and water flooded the street. Minutes before 3 p.m., the fire was declared under control. An investigation by Ottawa Fire and the Office of the Fire Marshal is underway.